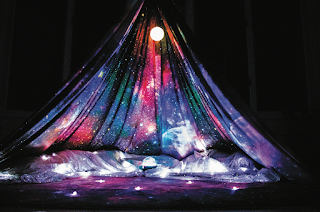 Blanket Fort: Growing Up Is Optional will get your imagination going with practical and beautiful DIY fort ideas for craft lovers of all ages. 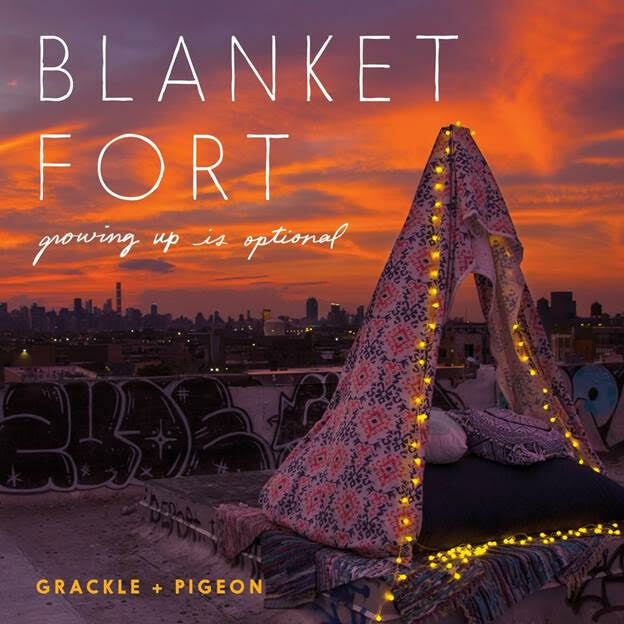 This is a one-of-a-kind collection of 25 artisanal blanket forts which will inspire readers to envision cozy hideouts in their living rooms, yards, yoga studios, and work spaces. Each project includes a mix of four color photographs and charming pen-and-ink instructional illustrations. Grackle + Pigeon have worked together across print, theater, video, and the web to bring artful concepts to fruition. Their work can also be found in the independently published novels Dahlia Cassandra and Concrete Fever. Their philosophy is that everyone needs a little magic in their realism. "Let's face it - adulting is hard," write Grackle + Pigeon. "Gone are the days when life's biggest worry was getting caught breaking curfew. Nowadays, if you stay up late, you feel awful the next day. Come on, body. Get with the program. We are adventurous young spirits ready to take the world by storm. "Not going to lie. Ambition is exhausting. Bed cuddles are awesome. Can't we just not deal for a while and take refuge in a pile of pillows and blankets and maybe, just maybe, redefine what adulting actually means? "We are Grackle + Pigeon, and we're all about getting creative visions airborne. 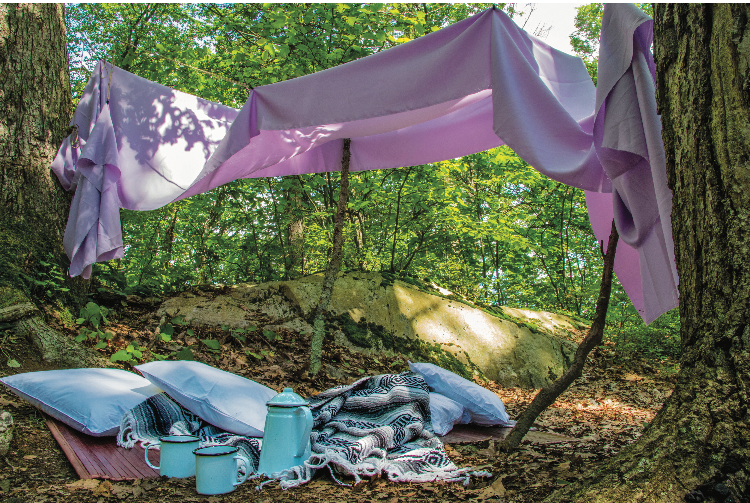 As a husband-and-wife artistic team, we've collaborated across print, multimedia, and live performance - and now, we are so stoked to bring you twenty-plus variations on the pinnacle of all things awesome: blanket forts." 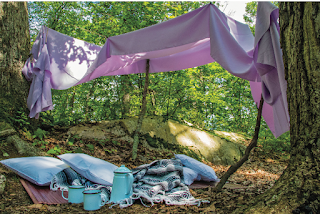 Bears Love Breakfast is a fun idea for a rustic camping feel, and it is as simple to make as a couple of blankets and some sticks. There are some peaceful, whimsical ideas. 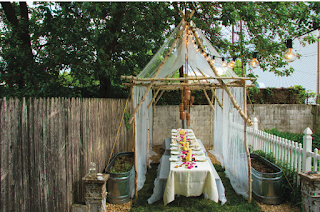 Om Shanti, the Yoga fort, is clean and simple, and the perfect place to clear your mind. 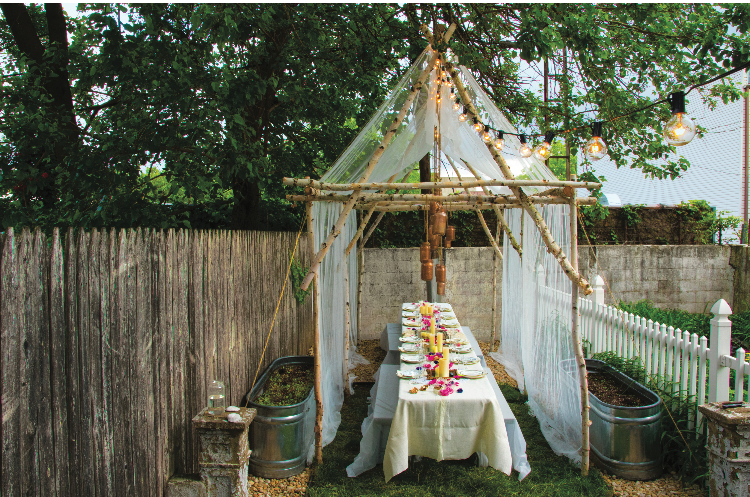 The decadent Garden Party is a backyard piece de resistance worthy of a wedding reception, even if it's not the biggest one. 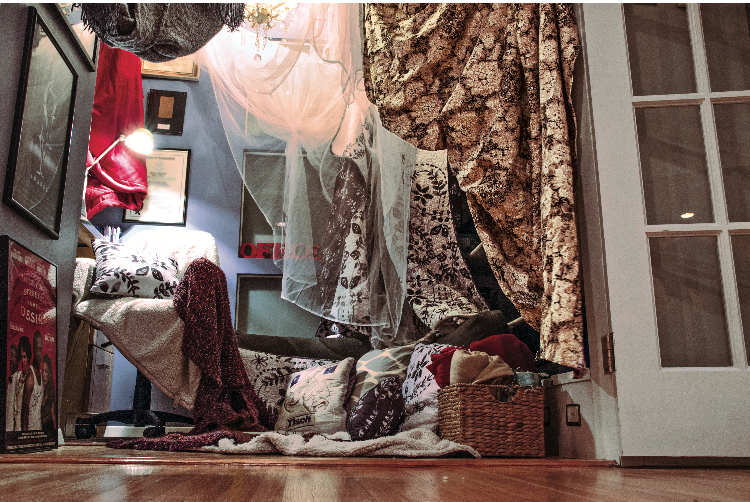 A couple forts fit for inside the home are RPG OMG and Office Space. RPG OMG is a retro throwback slumber party fort for your entire living room. Office Space, which will transform your home office into a pillow-forward, fluorescent-light-free work nook. 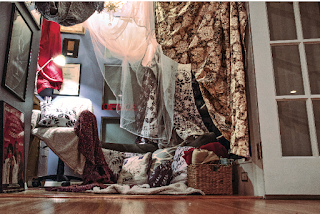 The book’s frontmatter outlines the basic frames that are used to create the forts, and the instructional drawings throughout show the forts’ bones, but Blanket Fort is more a lifestyle book than a craft book—one which invites people of any income to look and dream, the perfect gift for a couple moving in together or your best friend from childhood. 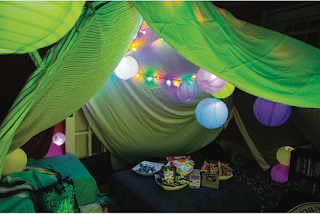 Parents planning for a novel sleepover will also find ideas inside. Grackle + Pigeon are doing an immersive fort event and book signing at Powehouse Arena in Dumbo on Sunday, October 7 at 2pm.